Posted on October 3, 2010 March 3, 2018 by Marty Schoenleber, Jr. Developing an “intensely local” vision for church planters and others who just want to make a difference. Serve your neighbor. i.e., shovel his driveway, cut his lawn etc. Invite your neighbor into your home, backyard. i.e., BBQ regularly. Accept every invitation to visit with your neighbor, even if it means canceling another engagement. i.e., Christmas and New Years parties. Don’t wait for them to come to you, you go to them. Coach kids if you have the skill. Become a community organizer for block parties, golf outings, etc. Look for opportunities to visit with neighbors. Be completely upfront about your Christian faith. Give the neighbors spectacles with which to view your life. Don’t expect your non-Christian neighbor to behave like a mature Christian. Pray not only for your neighbors but with your neighbors. Welcome new neighbors into the neighborhood and then into your home and lives. Make it your ambition to be his best friend in the neighborhood. When individuals begin to do these kinds of activities they begin to uncover the hurts, the pains, the disappointments, the joys and the victories of their neighbors. When this happens, we are much closer to figuring out the contextual forms most appropriate to ensure that the gospel is heard clearly. This type of caring and involvement in the community has the added benefit of not only expressing care but also of supplying a kind of reconnaissance into the interior of the neighborhood’s soul. We discover what its idols are. We find the captivities of its spirit and the things that cripple its discernment. This is part of what the apostle Paul was doing while he waited in Athens for his associates to arrive from Berea (Acts 17:16-34). Two books that are helpful though somewhat different in approach are Bill Hybels and Mark Mittleberg’s Becoming a Contagious Christian, (Grand Rapids, Mich.: Zondervan, 1995) and Halter and Smay’s The Tangible Kingdom, (2008). These are great suggestions Marty and I think about them often when looking for opportunities to impact our immediate neighborhood for Jesus. However, I’ve come to the realization that although I might be interested in hosting church with my doorstep, the Lord is often working on the other side of town where people are actually open and need me. I continue to labor in my neighborhood, but we can’t limit where God wants to establish a work to my street only either. I am along side you with doorstep ministry! I use the term often when telling people what we are about and I give you all the credit my friend! In the last three weeks we have had neighborhood bonfires in our new backyard that have been great successes in outreach! I completely agree. God works where He wants to and we have a responsibility to a whole town. These are just a primer for being faithful in our nearest neighborhood. Glad the bonfires are going well. May Jesus be exalted in your ‘hood. This is all fine and good for those of you who live in the typical white, suburban gated cul-de-sac neighborhoods that it seems most Christians prefer. However, the greater proportion of people live in less desirable neighborhoods, that are not insulated from the social ills so common to the city. I live in a downtown midrise building, with over 150 units. No backyards. Golf is not in the vocabulary. No driveways or windows for lights to show if neighbors are home or not. One of the neighbors is a suspected drug dealer. What is your suggestion for pressing flesh in neighborhoods that are not mono-cultural and relatively crime-free? Kurt, great push back brother. First, slow down in your evaluation. there are principles here that will work in your context too. Second, see my chapter in A Heart for the Community: New Models for Urban and Suburban Ministry by John Fuder and Noel Castellanos (Moody Press). The church I planted and in which we utilized many of these ideas was definitely not a gated community, had 23 countries of birth represented in the congregation, and had a very urban texture to most of our ministries. Third, let me give you a couple of ideas to prime the pump. 1. Leaflet your high rise and invite people to have some pie at your place. 2. Begin collecting names of people and praying for them regularly. 3. Begin to find out what is “in the vocabulary.” (unwed mothers, drug dealers, high rent etc.) Sounds like you already are learning some of these things. Pray for opportunities to build bridges. 5. Knock on the drug dealers door and ask him/her if they want anything when you go on your next coffee run. 6. Become a community organizer for the things that are issues in your neighborhood. The first seven principles in the post are still true no matter where we live and if God has placed you where you are, and he has, you have a responsibility to take the gospel to your neighbors. Pressing the flesh will be harder in the situation you describe. But it is still the need. Praying for you brother. Go for it. * I am called to sow seed – Jesus said He would build His Church. It’s important to be clear on roles. * My role in Christ’s mission: Love God, Love my neighbor, love one another, love even my enemy, make disciples. And the Church has grown – while 4 years ago none of my neighbors were churched, now over half are. Tom, fantastic results in your neighborhood brother. Would love to get together and see how you are doing since the class. Will you be able to join us for the November Mentor Group (RebelONE)? Marty, great words of challenge and encouragement–thanks. I especially appreciate the mention of “and others” along with church planters. We who are involved in long-established churches need to be exhorted to look up and outward to our neighborhoods. My own warped heart too easily settles into an inward-oriented perspective on church life, and I know that many of the people I pastor tend to struggle in the same way. Thanks for practical suggestions. Always good to hear from you brother. Best wishes on the book. What is the publication date? Maybe we could do an interview on the blog before the release. The book comes out this week (Nov. 10). I’ll send you a copy. I’d be delighted to do an interview on the book–sorry so slow to reply, thanks for your interest in it! One suggestion – I think a lot of people are fundamentally incapable of keeping their commitments, not due to a lack of character, but due to a lack of competence in managing their lives. They want to make a difference but the constellation of disciplines required to manage their life are missing and they don’t know it or they don’t know how to get it. Life in America will over run you if you have not learned to manage your life. This gets in the way of any type of ministry, traditional or intensely local. Realistically some people will need a push in the right direction or they will not become effective in ministry. Doug, I think you are right. that’s why we need to do these things in community. Gathering with even one other Christian family in a neighborhood to pray for it and work at reaching it together, even when they go to different churches is a great way to start the process. We need accountability absolutely. This is part of the task of leadership, both in the church body and in our homes. Antbed, thanks again for your kindness. This is really jsut a start but it can get us moving in the right direction. I hope it is helpful. Everyone, take a look at Antbed’s blog. Some great thoughts over there. I would also add to the list to have what I call “Planned Free Time” to be intensely local. Don’t over plan or over schedule, have time to be free to move as the Spirit leads. I think Josh’s addition to the list of ideas of “Planned Free Time” is crucial. It is so easy for me to over schedule my life such that I have very little time to be available for my neighbors. I doubt I am alone in this. Another idea that I may have heard from Marty in a class or read somewhere is to think creatively about the things you have to do anyway and see if those can become opportunities to “press the flesh” in the neighborhood. 1. Going to the grocery store – Stop by the neighbor’s house and ask if they need anything. I had just finished having some quiet time with God… praying for my husband as his plan for ministry is changing rapidly when I checked my blog stats for the day. WordPress is a funny site and often sends me links to posts that seem to compliment mine, as I am sure yours does. Well, I clicked and landed here. What a good thing. What a God thing. I just spent an hour reading and sending links to my husband. Great blog! Off to find your book now. Thanks CeCe, I hope you enjoyed your romp through the posts. Where do you and your husband serve? Is he a church planter? I certainly did enjoy my romp through your blog! I am still romping, in fact. My husband served a small dying church in the middle of the cornfields last year and is finishing up his MDiv in May. (second career.. we are not spring chickens) While the pragmatist that resides in my husband’s brain is resisting, (the pragmatist that once lived in me was kicked out years ago.. ha!) he feels his call is deeper than serving an existing denominational church. We really REALLY want to reach the under served and unchurched. Marty, I do not know if you have addressed this elsewhere on your blog, but I have been thinking recently about an intensely local philosophy of ministry. Your post here and the discussion following has continued to give me much to think about. My question is in regards to the focus of missions. Does having an intensely local philosophy of ministry mean that the church’s missions focus is primarily local or is there a way to balance a focus on worldwide missions while also being intensely local? What might this look like for either a church plant or an established church? Great question Tony. (By the way, it is great to see two former students interacting together on the blog.) Josh had a great comment. Okay, back to your question: Intensely Local ministry doesn’t mean an exclusively local ministry. But it does mean that the global aspects of ministry begin to flow out of the local opportunities. 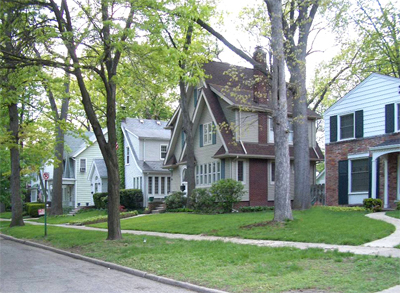 For example, one neighborhood finds that in their ‘hood there is a neighbor from Ethiopia. Suddenly, they become much more attuned to news reports on Africa, Darfur and the Islamic threat to Christian communities around the globe. That leads them to begin to seek out how they can make a difference both with Ethiopian refugees in their town but also in taking the gospel to Darfur or speaking out about Darfur or mobilizing prayer for Darfur, etc. Does that prime the pump a bit?